SYDNEY, NSW. 1914-08. PORTRAIT OF “PRIVATE JOHN NICHOLSON OF C COMPANY, 1ST BATTALION, 1ST INFANTRY BRIGADE, 1ST AUSTRALIAN DIVISION, ENGLAND (THIS IS THE ADDRESS WE HAD TO LEAVE). 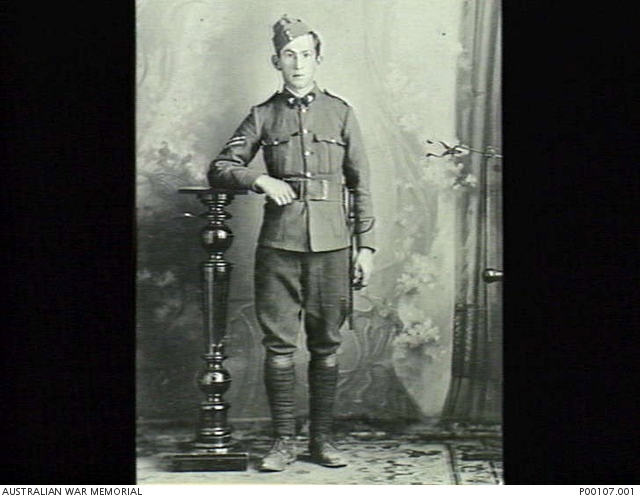 THIS PHOTO WAS TAKEN IN 1914-08 WHEN I ENLISTED IN THE AIF. AT THAT TIME I WAS IN THE ST GEORGES RIFLES REGIMENT AND A CORPORAL AT THE TIME, BUT ON ENLISTMENT IN THE AIF, ALL NON COMMISSIONED OFFICERS BECAME PRIVATES AGAIN. THEY DID NOT WANT YOUNG FELLOWS GIVING INSTRUCTIONS TO FULLY GROWN MEN.” (DONOR: ABC).